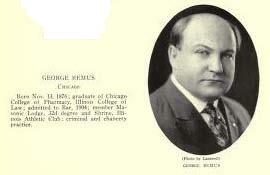 George Remus (1876 - 1952) was born in Germany and his family emigrated to Chicago when he was 5. After Prohibition was enacted in 1920, Remus decided he could make a lot more money in illegal alcohol than practicing law and he became so successful he was called The "King of the Bootleggers." Remus was eventually convicted and sent the federal penitentiary in Atlanta for two years. His wife then took up with a prohibition agent and the two looted Remus's fortune, selling his assets and hiding the money. She reportedly also tried to have him deported and only gave him $100 from the sale of one of his distilleries; furthermore, Remus believed she hired hit men to kill him. His wife filed for divorce and on October 6, 1927 in Cincinnati while she and her daughter were riding in a cab to court to finalize the divorce, Remus instructed his driver to chase the cab. He had the driver force it off the road and Remus accosted his wife and shot her. She died later that day. Remus turned himself into the police an hour later. Remus was tried for first degree murder and he was prosecuted by Charles Taft, the 30 year-old son of Chief Justice and former President William Howard Taft. Remus hired several high priced defense attorneys but he also participated in his own defense. Remus claimed that he shot his wife because he was suffering from "transitory maniacal insanity" caused by his wife and her lover's persecution of him for the previous two years. On December 8, 1927 Darrow testified as a character witness for Remus. On December 27, after 19 minutes of deliberation, the jury found Remus not guilty on the sole ground of insanity. Because he was found insane the matter was certified to the probate court in Ohio. On December 30, 1927, the probate court found that Remus was then insane, and ordered him committed to the Lima State Hospital for the insane. On February 1, 1928, Remus filed a writ of habeas corpus to the Court of Appeals alleging that he was unlawfully restrained of his liberty. On March 30, 1928, the Court of Appeals found that the Remus was not insane, and ordered his discharge from the Lima State Hospital. Some sources speculate that Remus was the inspiration for Jay Gatsby, the title character in F. Scott Fitzgerald's "The Great Gatsby."